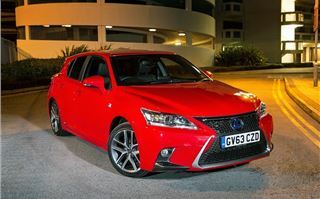 Despite a lukewarm reception from critics when it was launched in 2010, the CT 200h has since been the best selling Lexus in the UK. For its midlife facelift, Lexus has sought to improve the handling and refinement of its hybrid hatchback, while bringing the styling up to date. It's also dropped the price. 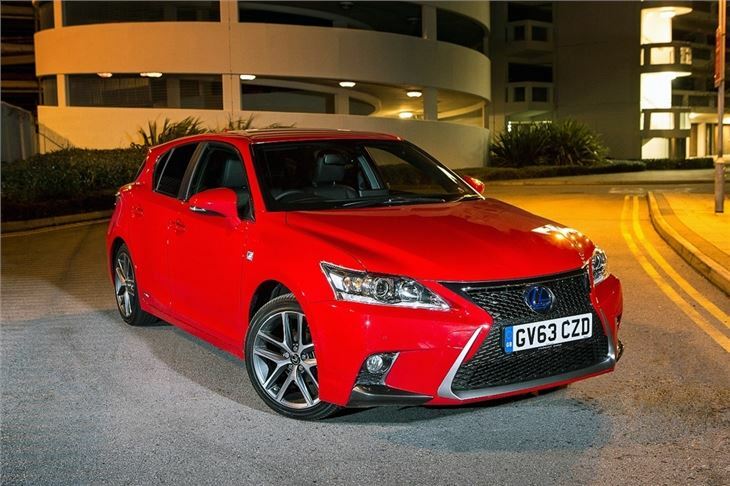 Externally the CT 200h has been brought in line with the current IS and GS, with the Lexus ‘spindle’ grille, tweaked alloy wheel designs and subtle aerodynamic improvements. These slight tweaks, paired with improvements to the powertrain, reduce emissions across the board. However, despite the improvements, Lexus has reduced the price of the CT200h by between £1000 and £1500 depending on trim level. CO2 emissions are down to as low as 82g/km if you go for an entry model with the smaller wheels – but even cars with 17-inch wheels come in below 100g/km. Coupled with the lower price, this is good news for company car drivers - the main target for the CT 200h - who get the advantage of a low BIK rate, especially when compared to rival cars with an automatic transmission. That standard fit automatic transmission in the CT 200h is a bone of contention though. It's a CVT system and so doesn’t have any conventional gear ratios, which can take some getting used to. Generally speaking the CT 200h is relaxed, refined and easy to drive, with the transmission settling down to a barely audible hum – but if you need to push on the engine becomes loud and quite coarse. If you spend most of your time on motorways and in town there should be no problem – the CT 200h often runs completely silently as a pure EV and even when the engine does kick in it tends to be quite hushed. However on twisting roads, where you tend to be on and off the throttle regularly, things can get raucous and the otherwise serene nature of the Lexus disappears. Noise aside, the CT 200h is surefooted through twists and turns and an improvement on before. Lexus has worked to reinforce the structure with additional welds to increase rigidity. That said, it never feels like a car that’s meant to be thrown around – all the grip seems to be there to keep the driver and passengers safe, rather than entertained. The suspension has been tweaked to improve the ride quality, which is acceptable if not fantastic – it thumps over larger lumps and bumps. The CT 200h really comes into its own in town, where the CVT transmission, hybrid powertrain and the light yet accurate steering combine to make for a very easy-to-drive car that’s comfortable and relaxing. It’s made all the better by a well finished cabin. The material quality is impressive and the layout is simple and intuitive. There are plenty of customisation options, so buyers can pick the colours and materials of various trim elements to suit their tastes. That said, there are a few details that let the car down a little, including some less than impressive plastics that wouldn't pass muster in an Audi or BMW. Practicality could be better too. There’s a battery pack under the boot floor, which pushes the height of the load deck up. With the tonneau cover in place there really isn’t that much space in the boot and you’ll struggle to get taller adults in the back seats. Although they are fine for children. Standard equipment levels are reasonable – all cars get DAB, Bluetooth, a colour infotainment screen and USB connectivity, while moving up to higher trim levels adds useful features like cruise control and navigation. There’s a host of optional extras, including an enhanced navigation and adaptive cruise control. Unfortunately, picking higher equipment grades ramps up the price – if you go for a top Premier model you’ll be paying close to £30,000, which is hard to justify even if you consider the Mark Levinson audio system and Premium Navigation system. Lexus has certainly improved the CT 200h, making it a more desirable model. It will suit urban drivers, but for many the sometimes coarse sounding engine and the lack of driver enjoyment will be a problem, especially considering the price is on par with rivals like the Audi A3 and BMW 1 Series. There’s a lot to like about the CT 200h, but it still isn't top of the class.